These Terms and Conditions govern the relationship with users of this website. By accessing this website you agree to the following Terms and Conditions of Fabulous Miami, LLC. The term Fabulous Miami, LLC or 'us' or 'we' refers to the owner of the Website. 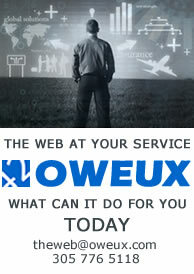 The term 'you' refers to the user or viewer of our website. The content of the pages of this Website is for your general information and use only. It is subject to change at any time without notice. Neither we nor any third parties provide any warranty or guarantee as to the accuracy, timeliness, performance, completeness or suitability of the information and materials found or offered on this Website for any particular purpose. You acknowledge that such information and materials may contain inaccuracies or errors and we expressly exclude any and all liability for any such inaccuracies or errors to the fullest extent permitted by law. This Website contains material which is owned by or licensed to us. This material includes, but is not limited to, the design, layout, look, appearance and graphics. Reproduction of any of the material herein is strictly prohibited. Unauthorized use of this Website may give rise to a claim for money and equitable damages in and/or may be a criminal offence. We reserve the right to remove any content posted by members at our sole discretion, for reasons including but not limited to that it is unlawful, threatening, libelous, defamatory, fraudulent, obscene or otherwise objectionable, or because it may infringe or violate any third party's intellectual property or privacy rights. We reserve the right to seek legal redress against any member who causes any claims, losses or damages to us. From time to time this Website may also include links to other websites. These links are provided for your convenience to provide further information. We have no responsibility for the content of these website(s). FABULOUS MIAMI, LLC IS NOT RESPONSIBLE FOR THE ACTIONS OR CONTENT OF THIRD PARTIES CONTAINED ON THESE LINKED WEBSITES OR OTHERWISE AND YOU AGREE TO RELEASE US, OR MEMBERS AND MANAGERS, EMPLOYEES, AND AGENTS FROM ANY CLAIMS AND DAMAGES KNOWN ANDUNKNOWN, ARISING OUT OF OR IN ANY WAY CONNECTED WITH ANY CLAIM YOU MAY HAVE AGASINT ANY SUCH PARTIES. You may not create a link to this Website from another Website or document without Fabulous Miami, LLC's prior written consent. Your use of this Website and any dispute arising out of such use of the Website is subject to the laws of the State of Florida. These terms and conditions will be governed by and construed in accordance with the laws of the State of Florida, without giving effect to its conflict of laws provisions or your actual state or country of residence. The parties agree to submit to the personal and exclusive jurisdiction of the courts located in the United States District Court, Southern District of Florida. If for any reason a court of competent jurisdiction finds any provision or portion of these terms and conditions to be unenforceable, the remainder of the terms and conditions will continue to remain in full force and effect. Fabulous Miami, LLC reserves its right to change this policy from time to time without any notification to its users; however, we encourage you to periodically check our policies for any changes. Any and all comments, feedback, ideas, suggestions, submissions or other communications (collectively, “Comments”) that you submit to us through our Website shall become the exclusive property of Fabulous Miami, LLC. The submission of any Comments shall constitute an assignment to Fabulous Miami, LLC of all worldwide rights, titles and interests in all copyrights and other intellectual property rights in the Comments. Therefore, we will be entitled to use, reproduce, modify, publish, translate, create derivative works, display and distribute such comments for any purpose whatsoever. You agree not to submit any Comments to our Website that would violate any right of any third party, including copyright, trademark, privacy or other personal or proprietary rights. You further agree that no Comments submitted by you to our Website will contain libelous, otherwise unlawful, abusive or obscene material. You will be solely responsible for the content of any Comments you submit to us through the Website. You may choose to restrict the collection or use of your personal information in the following ways: if you have previously agreed to us using your personal information for direct marketing purposes, you may change your mind at any time by writing or emailing us at [email protected]. You will be required to register with Fabulous Miami, LLC’s website in order to manage your member account or access certain areas of our Website. You are responsible for maintaining the confidentiality of any username and password you use to access our Website. You agree to immediately notify Fabulous Miami, LLC of any unauthorized use of your password or user name or any other breach of security related to your account, and to ensure that you log off from your account on our Website at the end of each session. We are not liable for any loss or damage arising from your failure to comply with any of these obligations. The information contained in this Website is for general information purposes only. As mentioned the information is provided by Fabulous Miami, LLC and while we strive to keep the information up to date and correct, we make no representations or warranties of any kind, express or implied, about the completeness, accuracy, reliability, suitability or availability with respect to the Website or the information, products, services, or related graphics contained on the Website for any purpose. Any reliance you place on such information is therefore strictly at your own risk. In no event will we be liable for any loss or damage including without limitation, indirect or consequential loss or damage, or any loss or damage whatsoever arising in tort or in contract from loss of data or profits arising out of, or in connection with, the use of this website. Through this Website you are able to link to other websites which are not under the control of Fabulous Miami, LLC. We have no control over the nature, content and availability of those sites. The inclusion of any links does not necessarily imply a recommendation or endorse the views expressed within them. Every effort is made to keep the Website up and running smoothly. However: Without limiting the foregoing, under no circumstances shall Fabulous Miami, LLC. be held liable for any delay or failure in performance resulting directly or indirectly from acts of nature, forces, or causes beyond its reasonable control, including, without limitation, Internet failures, computer equipment failures, software failures, telecommunication equipment failures, other equipment failures, electrical power failures, strikes, labor disputes, riots, insurrections, civil disturbances, shortages of labor or materials, fires, floods, storms, explosions, acts of God, war, governmental actions, orders of domestic or foreign courts or tribunals, non-performance of third parties, or loss of or fluctuations in heat, light, or air conditioning. Fabulous Miami, LLC takes no responsibility for, and will not be liable for, the Website to be temporarily unavailable due to technical issues beyond our control. Member shall indemnify and hold harmless Fabulous Miami, LLC from and against any and all actions, proceedings, losses, costs, fines, expenses (including, without limitation, the fees and expenses of counsel for Fabulous Miami, LLC), proceedings, claims and/or demands in any way arising out of the acts or omissions and/or the performance or failure to perform by Member in connection with the matters set forth herein or in any other way connected with the Terms and Conditions set forth herein. Fabulous Miami, LLC shall have no liability for consequential, incidental, special or indirect damages (including, without limitation, loss of profit and business opportunities) regardless of whether Fabulous Miami, LC has been advised of, or is aware that, such damages have been, or may be, incurred. To the extent permitted by applicable law, Member waives all claims based on a theory of quantum meruit or similar principles of law. This Website and its content is copyright of Fabulous Miami, LLC. © Fabulous Miami, LLC. 2009. All rights reserved. Any redistribution or reproduction of part or all of the contents of this website in any form is strictly prohibited. The Fabulous Miami, LLC. Website provides a medium and environment for socializing, networking and sharing information. If members enter into agreements with other members through Fabulous Miami, LLC, we are not a contracting party to any such agreements and expressly disclaim any liability or accountability for these agreements and/or relationships. We reserve the right to remove any content posted by members at our sole discretion, for reasons including but not limited to that it is unlawful, threatening, libelous, defamatory, fraudulent, obscene or otherwise objectionable, or because it may infringe or violate any party's intellectual property or privacy. We reserve the right to seek legal redress against any member who causes any claims, losses or damages toFabulous Miami, LLC. We will use reasonable efforts to monitor the content of the website. You understand and agree that you may encounter content with which you disagree or find inappropriate. Your use of the Website with this understanding constitutes your acceptance of this and is an express waiver of liability and/or any claims against Fabulous Miami, LLC, its Members, Managers, employees or agents. Fabulous Miami, LLC. does not claim ownership of the materials you provide to us (including feedback and suggestions) or post, upload, input or submit to any Fabulous Miami, LLC’s Website or its associated services (collectively "Submissions"). However, by posting, uploading, inputting, providing or submitting your submission you are granting Fabulous Miami, LLC permission to use your submission in connection with the operation of their internet businesses including, without limitation, the rights to: copy, distribute, transmit, publicly display, publicly perform, reproduce, edit, translate and reformat your submission; and to publish your name in connection with your submission. Fabulous Miami, LLC. is granted and retains a worldwide, non-exclusive, royalty-free, perpetual, irrevocable right to display any content on our Website by posting or submitting any information on the website. No compensation will be paid with respect to the use of your submission, as provided herein. Fabulous Miami, LLC. is under no obligation to post or use any Submission you may provide and may remove any submission at any time in our sole discretion. Fabulous Miami, LLC may contain links to other websites (hyperlinks or linked sites). The hyperlinks or linked sites are not under the control Fabulous Miami, LLC is not responsible for the contents of any linked site, including without limitation any link contained in a linked site, or any changes or updates to a linked site. Fabulous Miami is not responsible for webcasting or any other form of transmission received from any linked site. Fabulous Miami, LLC is providing these links to you only as a convenience, and the inclusion of any link does not imply our endorsement of the site or any association with its operators. You may not use the Fabulous Miami, LLC’s website in any manner which could damage, disable, overburden, or impair the Fabulous Miami, LLC’s Website or interfere with any other party's use and enjoyment of the Fabulous Miami, LLC’s website. As a condition of your use of the Fabulous Miami, LLC’s website, you warrant us that you will not use the Fabulous Miami, LLC’s website for any purpose that is unlawful or prohibited by these terms, conditions, and notices. You may not obtain or attempt to obtain any materials or information through any means not intentionally made available or provided for through the Fabulous Miami, LLC’s website. The Website is for the personal use of individual Members only and may not be used in connection with any commercial endeavors. Passwords and compiled names, photos, links, and Web site content are not to be transferred or copied from the Website for use with any other product or service. Illegal and/or unauthorized uses of the Web site, including collecting usernames and/or email addresses of members by electronic or other means for the purpose of sending unsolicited email and unauthorized framing of or linking to the Web site will be investigated, and appropriate legal action will be taken, including without limitation, civil, criminal, and injunctive redress. You are representing Fabulous Miami, LLC while participating in any of our event. Members have no right or authority to organize events which are advertised or conducted under Fabulous Miami, LLC’s name. Any Fabulous Miami member organizing a meeting of Fabulous Miami’s members without the authorization of Fabulous Miami, LLC shall make it clear to all those attending that the meeting is not an authorized Fabulous Miami, LLC. Any Fabulous Miami member in breach of the stated terms and conditions or who attempts to organize an event will have his or her Membership cancelled. Any Fabulous Miami, member selling or attempting to sell tickets for or involving Fabulous Miami, LLC members or other persons in attending a non-Fabulous Miami, LLC event whether such sale or attempt to sell or attempt to involve is made at a Fabulous Miami, LLC event or directly or indirectly to Fabulous Miami, LLC Members will have his or her Membership cancelled. Please note that not all events of Fabulous Miami, LLC are free of charge. Fees and admission may apply. A Member may also be required to RSVP in advance to enter an Event. Some Events may have further restrictions. People under the age of 18 are not permitted at any Fabulous Miami, LLC’s events. By attending an event, you agree to allow any photo, video or film of you or your likeness to be used for any legitimate purpose by Fabulous Miami, LLC. As a condition of your use of the Service, you guarantee to Fabulous Miami, LLC that you will not use the Service for any purpose that is unlawful and / or prohibited by these terms, conditions, and notices. To allow the restaurant to better serve our group, Fabulous Miami, LLC requires that reservations to be made approximately two (2) days prior to an event date. Payments must be made in cash at the entrance of the restaurant. If reservations need to be made sooner due to event availability or the popularity of a restaurant, this shall be so stated in the newsletter. Cancellations are accepted up to two (2) days before the dinner/event. Within forty-eight (48) hours of cancellation the fee for an event will be charged to the Member’s credit card to accommodate for the expenses of the hosting company. In case of an emergency (for example accident, family affair etc.) the fee will be used as a credit to the Member for the next scheduled event. We require absolute proof in writing for such an emergency. Our Events invitations will be sent via email and also will be listed on our website under “Events”. 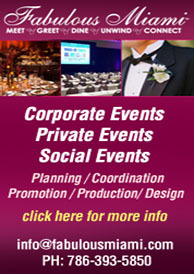 At each event a diverse selection of dinners and events are offered on a regular basis. Members are asked to arrive 30-45 minutes prior to dinner for an optional reception. Tables are typically arranged to seat approximately eight to ten diners each. >During the course of the meal, interesting and appealing selections are served while diners have the opportunity to become better acquainted with one another. Fabulous Miami, LLC is a platform for our members to manage existing connections while expanding their network. It is critical that each member use this platform in a manner that is acceptable to other members and our site administrators. While we encourage our members to communicate and connect with each other, we felt it necessary to create the following Rules & Regulations as a guide to using our site. We have provided the Message Center and the Forum as a means of communicating with other members. These tools should be use to communicate regarding various topics, including Social, Business and Travel. Members are strictly prohibited from using these tools to send unsolicited sales materials, messages or otherwise objectionable messages or threads. We do not assume the liability or guaranty the accuracy of any content in individual postings or messages. Profiles without information dilute our network and are subject to termination.